Fifty grueling hours into an unprecedented operation to separate adult twins conjoined at the head, Dr. Keith Goh's heart sank. He was working furiously Tuesday to save Laleh Bijani, who began bleeding profusely the moment surgeons made the final cut to separate her from her sister, Ladan. Gone was the sound of classical music that played the day before in the small, gleaming operating room crowded with doctors and assistants in aqua scrubs. The room now was mostly silent except for the surgeons' instructions and the beeps and pulses of the monitors. Then Goh glanced over at Ladan. She was losing blood even faster. 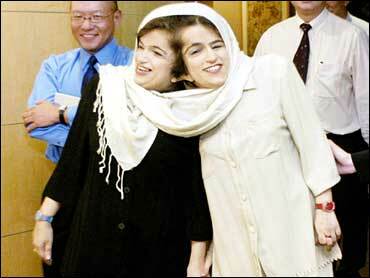 The 29-year-old Iranian twins died shortly thereafter — Ladan at 2:30 p.m. local time, and Laleh 90 minutes later. Both were still under anesthesia. "I was very saddened," said Goh, the lead surgeon. "I saw them struggling — of course at the same time we were struggling too." In their homeland, Iranians cried out in shock or wept as state television announced the deaths of the twins from a poor family who touched the world with their determination to lead separate lives — and to see each other face-to-face, rather than in a mirror. "Is my beloved Ladan really not with us anymore?" Zari, an elder sister, said after the first death was reported in Iran. Seconds later, she fainted. The twins were aware of the operation's high risks but had pressed for the surgery anyway. Ladan, the more talkative of the twins, had wanted to continue studying law and become a lawyer. Laleh, also a law school grad because she had little choice in the matter, had hoped to become a journalist. On Tuesday, diplomats were arranging for the return of their bodies to Iran for burial — in separate caskets. "At least we helped them achieve their dream of being separated," Goh said. CBS News Correspondent Mark Phillips reports the operation — which was so complex it was scheduled to take days and involve more than 100 doctors — ran into difficulties right from the beginning. The operation, the first attempt to separate a pair of adult twins born joined at the head, was fraught with difficulties not seen in infants. Surgeons repeatedly encountered surprises that preoperative scans and tests couldn't detect. The skull bone was denser and harder to cut than expected, the twins' distinct brains had fused together with tissue and their blood pressures and brain pressures proved unstable. Ultimately, it was the unpredictable changes in how their blood flowed, and surgeons' inability to cope with those changes, that killed the sisters, Goh said. Over three days, the team of 28 doctors and about 100 medical assistants worked in tight spaces in front of and behind the twins, who were in a sitting position in a custom-built brace connected to IVs and monitors. The blood started flowing uncontrollably the instant the surgeon cut through the point where the bottom of the brain touched the bone. One doctor said it was like a fountain. The twins were delicately placed on their sides on opposing operating tables as surgeons administered blood transfusions and battled to stabilize them. "Everyone upstairs is crying," said a nurse who assisted in the surgery, speaking on condition of anonymity. "We treated them like family because they had been here for seven months." Thirty-two hours into the procedure, surgeons had stopped the operation and considered calling it off — leaving the twins joined because blood wasn't flowing properly through a finger-thick vein they had stitched to Ladan's brain to compensate for the coming loss of a shared vein that drained blood to their hearts. Rerouting the shared vein was considered the biggest obstacle in the surgery. German doctors told the twins in 1996 that the shared vein made surgery too dangerous. Late Monday, surgeons faced the dilemma of leaving the twins joined and hoping they would recover or to "continue with the final stage of the surgery, which we knew would be very, very risky," said Dr. Loo Choon Yong, chairman of the 2-year-old Raffles Hospital, where the surgery was performed. The team consulted with friends of the twins who had come from Iran and stayed at a suite at the 380-bed hospital to be near them during surgery. "The team wanted to know once again, 'What are the wishes of Ladan and Laleh?' " Loo said. "We were told that Ladan and Laleh's wishes were to be separated under all circumstances." The surgeons devised new ways to drain the vein, and the surgery resumed. Singapore was the last stop for the twins in a lifelong quest to be separated. They were born into a family of 11 children in Firouzabad in southern Iran. They were raised by doctors in the capital, Tehran, under the spotlight of the Iranian media. They first found hope in Iran and then Germany that they could one day lead separate lives, but only ended up heartbroken. Their hopes were rekindled after they heard Goh had successfully separated a pair of 18-month-old Nepalese twins in 2001. The Bijanis came to Singapore in November and announced last month they would proceed with surgery. The Iranian government said Monday it would pay the nearly $300,000 cost of the operation. Goh said he had tried to talk the twins out of it but couldn't. After the deaths, the surgeon said he expected the ethics debate over whether he should have proceeded with the surgery could rage forever. "This decision of going ahead with surgery which seems so impossible to do was a very difficult one to make," he said. "But having seen and understood how these girls have suffered over their last 29 years, I and many other world-renowned experts decided to contribute our time and skills to trying to give these girls some measure of a decent, normal life as we know it." Dr. Benjamin Carson, the other lead surgeon on the operation who has separated three sets of twins fused at the head, agreed. "These were individuals who were absolutely determined to be separated. The reason I felt compelled to become involved is because I wanted to make sure they had their best chance," said Carson, who is head of Pediatric Neurosurgery at Johns Hopkins in Baltimore. Last-minute tests before the surgery revealed that the pressure inside the twins' brains was double what it should have been. "The implication was that the twins would get into trouble sooner or later if nothing was done," Loo said. Several bioethicists said later that they thought the operation was ethically justified, since the doctors believed they had a reasonable chance of success and the women understood the hazards. "The patients are the ultimate rulers, and they must decide whether to have a procedure when all the risks are laid out," said Dr. C. Rollins Hanlon, a former president of the American College of Surgeons.